It’s another sunny day in Southern California. The Ultimate Race Car Party is going strong in your backyard. Boys and girls cluster around the LEGO Car Building and Racing station, chatting excitedly as they pit their creations against the laws of physics. Later, guests sing “Happy Birthday” while the birthday kiddo makes a wish and blows out the candles. Everyone enjoys a piece (or two) of birthday cake. All too soon, the party comes to an end and it’s time to say goodbye. Thank guests for helping to celebrate your child’s special day; send them home with a thoughtful treat. 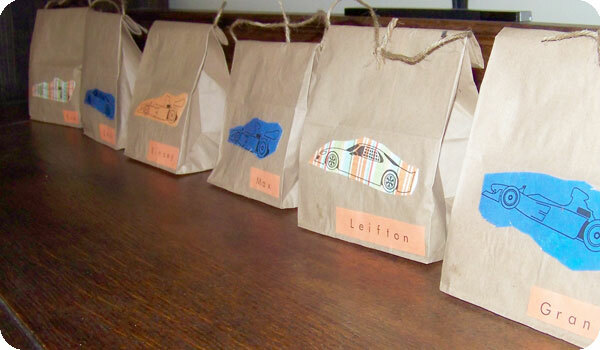 Here are some suggestions for fun, easy and affordable party favors with a race car flair. playparty.net is delighted to share these ideas with you. Four-year-old Max and his mom, Sarah Nielsen, hand-crafted their party favor bags. 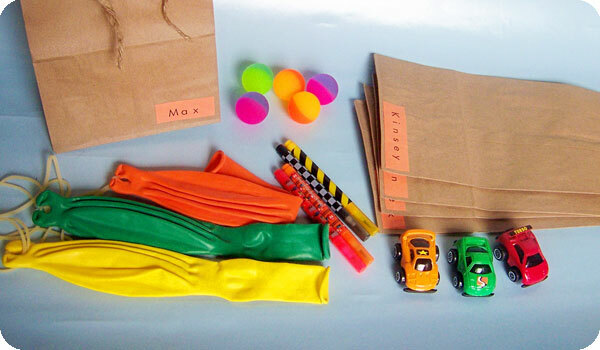 Max selected the favors — punch balloons, bouncy balls, race car pencils and toy cars. Then, Sarah printed race car graphics on colored paper. Max cut out the cars and glued them to the front of brown paper lunch bags. He put the favors inside the bags. Finally, Sarah made handles by tying jute beneath the folds. As you can see, Max’s party favor bags are charming and sweet. And what a great project for parent and child to do together! 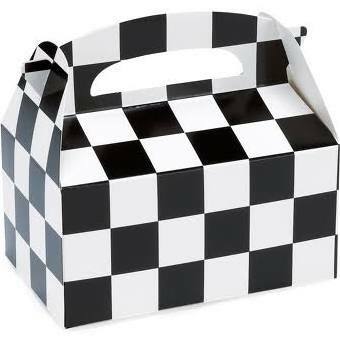 Black and white checkered boxes from Birthday Express are bright, cheerful and easy for kids to carry. They’re perfect for holding toys and snacks. Dusty Rogers threw a Disney PIXAR “Cars” party for her daughter’s third birthday and bought mini “Cars” lunch boxes as party favors. 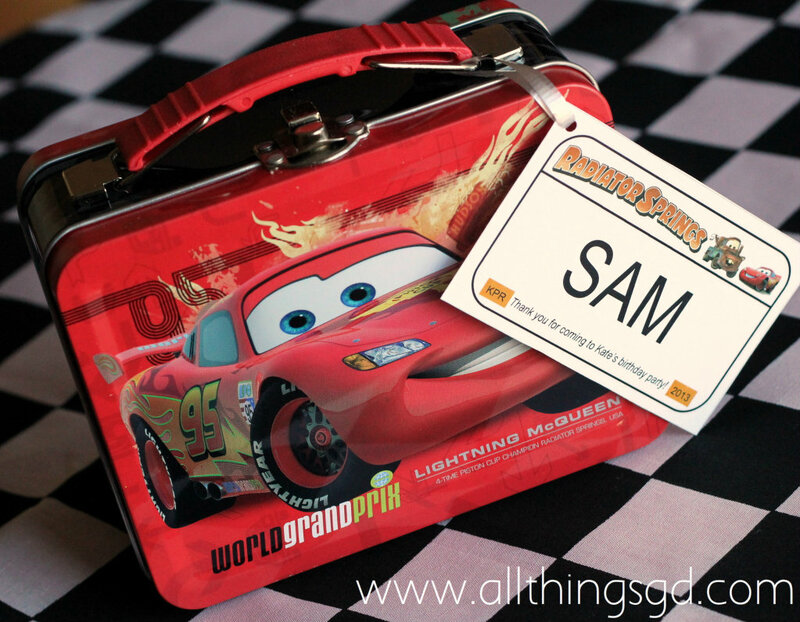 She printed a personalized Radiator Springs license plate for each guest and tied it to the lunch box with a pretty ribbon. Not sure what to put inside those bags and boxes? 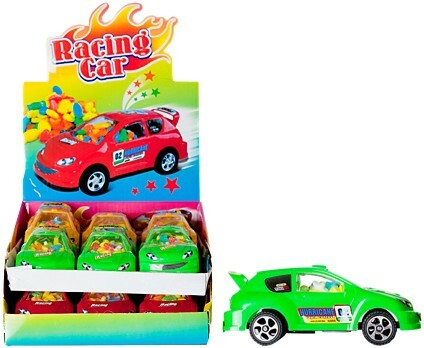 Guests will be thrilled to take home a rechargeable race car — the same toy car that generated so much excitement at the Giant Oval Race Track. Each car comes with its own charger. 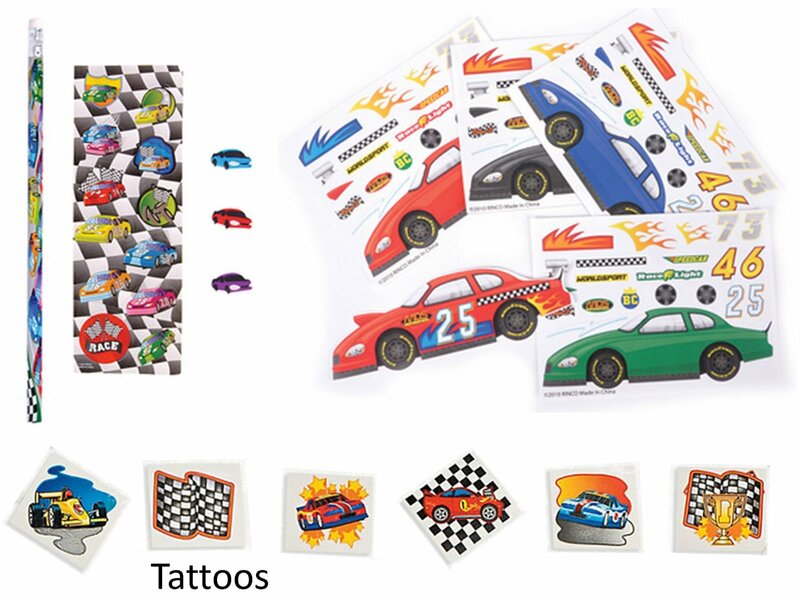 This 12-pack of race car party favors includes race car stickers, race car tattoos, race car pencils and race car erasers. 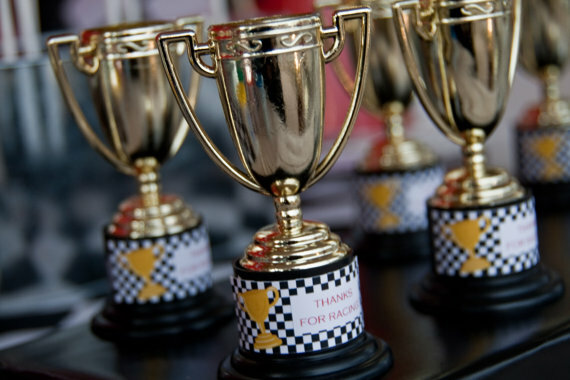 Gold-tone trophies from the Oriental Trading Company are popular with kids. Design and print your own labels or order stickers like these through Etsy. 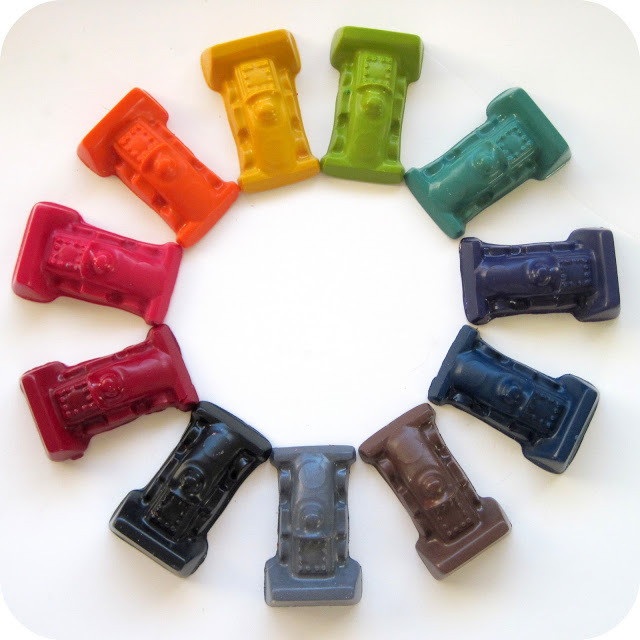 Homemade by Jill offers a tutorial on DIY race car crayons. She used a chocolate mold and a new box of 120 crayons to make 46 race cars. Cute, easy and inexpensive. Lastly, be sure to include something sweet. 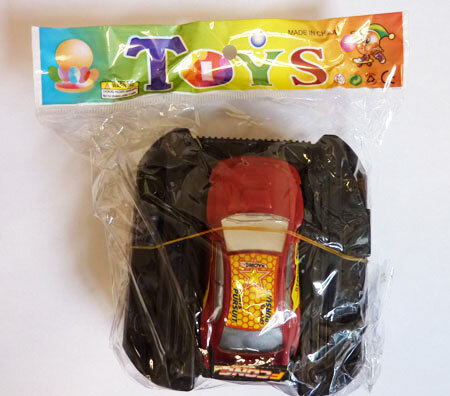 This racing car is filled with fruit-flavored candy and it’s also a pull-back toy. Two treats in one! Do you live in the San Fernando Valley, Los Angeles, Orange County or San Diego? Are you planning your child’s birthday party? Book the Ultimate Race Car Party with playparty.net, Southern California’s premier provider of children’s birthday party entertainment. And come back soon for more party planning tips.